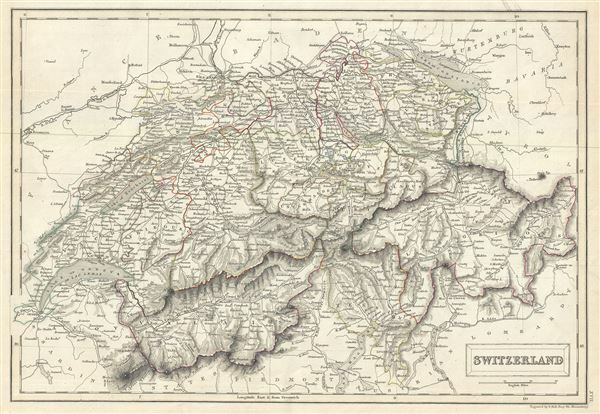 A fine example of Adam and Charles Black's 1844 map of Switzerland. It covers the entire country and shows the division by Cantons from Vaud to Grisons. Throughout, the map identifies various cities, towns, rivers, roadways, mountains and an assortment of additional topographical details with relief rendered by hachure. As this map was issued, Switzerland was undergoing a rapid social and economic change known as the Regeneration Movement. Following the French July Revolution in 1830, the Swiss began to assemble and call for fair representation and new Cantonal constitutions. After the ratification of a federal constitution in 1848, Switzerland underwent a rapid social and economic development. The cantonal currencies were replaced by a single currency (the Swiss Franc) and many of the cantons subsequently established representative governments and instituted freedom of the press and trade. This map was engraved by S. Hall for issue as plate no. XVII in the 1844 edition of Black's General Atlas. Very good. Original platemark visible. Blank on verso. Black mark on top left margin, not extending onto printed area. Rumsey 2305.024 (1854 edition). Philips (atlases) 4334.